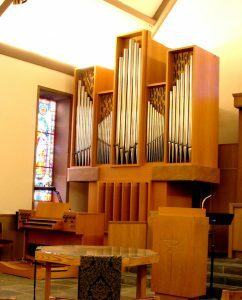 The Sander Chapel at University Temple United Methodist Church (UTUMC) in Seattle houses a fine 1968 Bosch tracker organ that was relocated from St. Bernadette RC Church to UTUMC in 2003 by Franz Bosman. UTUMC does not use it frequently, but it is in excellent condition. UTUMC is now offering it for sale. The instrument consists of 12 stops, 16 ranks, and 872 pipes, including an enclosed Swell division, and there are provisions for expansion. Specifications and several pictures are available at the Organ Historical Society website. Local churches that might be interested in the instrument can contact UTUMC Organist Howard Wolvington at (425) 761-4729 or by email at howard@utemple.org to arrange to examine the instrument or obtain further information.